By the end of the article – in addition to having had to look up the definition of “larder” (I had assumed it meant “one who consumes lard,” so I was surprised to discover that it is just a fancy word for “pantry”) – I was feeling distinctly bougie and ashamed. Blytheman makes the point that the recent obsession with quinoa among affluent people living in developed countries has driven up its price in the developing countries where it is produced (Bolivia and Peru), so that the people in those countries can no longer afford to eat it. Her problem with British vegans is that while Britain provides omnivores with locally produced meat and dairy products, “a rummage through the shopping baskets of vegetarians and vegans swiftly clocks up the food miles, a consequence of their higher dependency on products imported from faraway places.” Sorry, British Vegans, that you have chosen to live in a country whose land cannot produce fruits and vegetables (and whose journalists use words like “larder”). But if Blytheman’s point was as simple as she made it seem, then quinoa-loving Americans were not off the hook. A rummage through my larder would produce the 4-lb. bag of Nature’s Earthly Choice quinoa I bought at Costco last week. Now, I realize that we Americans are pretty solidly stuck on the hook for countless wrongs against people living in developing countries. But I just couldn’t stomach adding quinoa consumption to the long list of transgressions. So I decided to poke around for some second opinions. After about three minutes’ worth of Google searches extensive research, I found evidence that the quinoa issue was more complicated than Blytheman made it out to be. 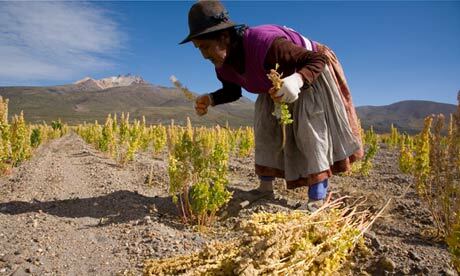 Just two days before Blytheman’s article appeared in The Guardian, an article by Dan Collyns entitled Quinoa Brings Riches to the Andes was published… in The Guardian. Oh, naturally. A quick rummage in my larder would reveal that all my caviar is of the beluga variety. I mean, really. And in Peru, a new government campaign has drastically reduced chronic malnutrition in children under five. This progress seems to be a result of the nearly $35 million Peru earned from quinoa exports in 2012; similarly, quinoa exports have boosted Bolivia’s economy by $85 million, according to Victor Hugo Vásquez, Bolivia's vice-minister for rural development and agriculture. The governments of both countries have also launched campaigns to promote national consumption of quinoa as part of a healthy diet. So it could be argued that the rising price of quinoa is benefiting the citizens of the countries where it is produced, as their governments use their increased funds to combat malnutrition. Clearly, as these two articles appearing in the same publication two days apart demonstrate, the issues surrounding quinoa’s popularity are quite complicated, and the consequences for the people of Bolivia and Peru are mixed. One way to avoid feeling guilty about your quinoa addiction is to get your fix from within the United States. The only place I can find that produces quinoa is White Mountain Farm in Colorado, but I’m sure there are other sources. Given all the unseen damage caused by the lifestyle we take for granted (and by “we” I mean affluent citizens of developed countries, British vegans included), the concentration of concern around quinoa seems misguided. The funny thing is that I don't even like quinoa...I just read the articles because John loves it lol.